The Art Rewired Spotlight Event. Ivy Reiss, publisher & editor in chief of The Artis showcases the 3rd issue, featuring The 905's Group of Four for the Art Rewired spotlight event, held on February 1st 2018 at the Waterside Inn, Mississauga, ON. Photo by Mira Louis. The 905's Group of Four and Artis 3 centrefold artist Roland Armitage & Kylie. Photo by Mira Louis. Group of Four artists: Carrie Hind, Gary Woyotowich, and Artis 3 cover artist, Abel Mekonnen, standing with children's author Anjula Evans. Photo by Mira Louis. Read The Artis 3 Editor's Letter to see the vision for this issue and event. Just some of the 140 people at the fully booked event. Photo by Mira Louis. Read Mississauga's SNAPD live coverage from the Art Rewired event, by Mira Louis. The Group of Four's Gary Woyotowich & Susan. Photo by Mira Louis. 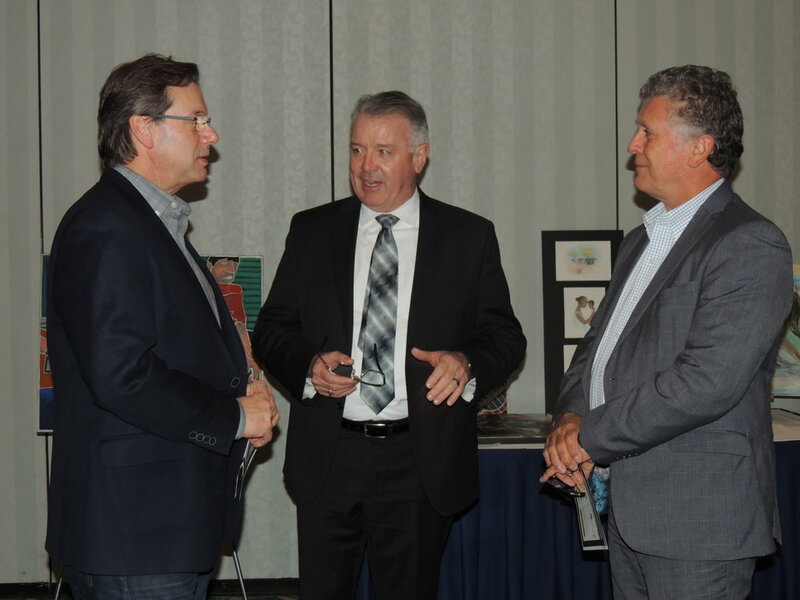 MPP Kevin Flynn (centre) with colleagues Brad & Bill. Photo by Mira Louis. Artist Carrie Hind from The 905's Group of Four stands in front of one of her masterpieces with Doloris. Photo by Mira Louis. Neuropsychiatrist Dr. Seyone (centre) with Mind Forward Brain Injury Services team members Ashley Budd & Lisa Philips-Borges. Photo by Mira Louis. Mind Forward Brain Injury Services team members Fabio Do Couto, Ashley Budd, Allen McMullan & Lisa Philips-Borges. Photo by Mira Louis. The Artis 3 contributing artist Naomi Laufer (centre) shows off her art, with fellow artist Susan & Editor in Chief Ivy Reiss. Photo by Mira Louis. Contributing artists Eva Kolacz & Kim Cayer, with fellow artists Cheyenne & Susan. Photo by Mira Louis. The Artis 3 contributor Donna Langevin & Jim. Photo by Mira Louis. Keynote Speaker of the evening and Artis Op-Ed contributor Frank Veri (right) admiring Eva Kolacz's art with friend Sundar. Photo by Mira Louis. The Artis 3 Featurette artist and ABI & mental health advocate Navjot Gurm & some of her artwork. Photo by Mira Louis.